match the same environment from which they originated. you take to ensure the plants comfort will be a giant step towards keeping them healthy. The most important elements needed for indoor plant health are water, light and fresh air. fertilizing requirements will differ greatly from season to season. A little research should be done for each of your House Plants to understand their individual needs. 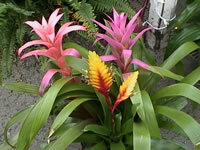 Most House Plants should be thoroughly soaked as soon as the soil dries during periods of active growth. Some plants, however, must never be allowed to dry out completely. due to temperature variations, humidity and soil types etc. It is better to keep an indoor plant on a slightly dry side than over watered. More houseplants die from over watering than any other cause! Never allow your House Plant to stand in a saucer of water for more than an hour or two! City water is treated with chemicals for your safety, however most House Plants don't like chlorine or fluoride, so it's a very good idea to allow the water to sit in an open container for at least 24 hours prior to using it for watering. This is enough time for the chemicals to dissipate and evaporate from the water and bring the water up to room temperature. Even though my water comes from a mountain spring, I still keep a couple of gallon milk bottles filled for watering, so it is warmed to room temperature before I use it. Personally, I don't like cold water dumped on me... Do you? The amount and the intensity of the light that the plant receives dictates much of a plant's life cycle. Even though a plant species that may have originated in a jungle where it thrives in the shade of trees, appears to be getting plenty of light, the intensity of the light indoors may be much lower than what the plant actually needs. Insufficient light usually manifests itself with paler foliage, lanky growth, and general lack of luster. When this happens you must do whatever you can to increase the light intensity for that plant. or moving it to another room with different light exposure. When you change the light drastically for a house plant, do it gradually to accustom them to the brighter light. 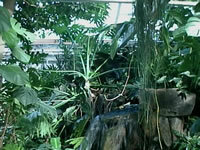 Plants will sunburn if they are put into too bright of a light after their skins have become tender from lack of light. and have the plant in the heated area. It isn't necessary for your plant to even know that it is winter. You can dictate many of your plants functions by giving them supplemental, artificial light. There are 'grow lights' on the market today that successfully imitate the same light spectrum of natural sun. These flourescent lights aren't perfect, and if they are the sole source of lighting, it will be necessary to have them on for 12-16 hours each day. It is a good idea to have them set on a timer so that the light hours are regular. If your intent is just to fool your plant into thinking that it is a certain season for blooming or whatever reason, you can set the timer to come on as the light begins to fade, and make your house plants day as long as you'd like. Many flowering and foliage plants actually grow and look better indoors when grown under artificial lights. cut back the hours now and then and let your plants have a temporary period of dormancy. Plants sense the natural shortening of daylight hours and may go dormant as they would in their natural habitat. This is usually a time when the amount of watering is decreased. On the other hand, many plants actively begin to grow or bloom, so they must have more water, and be fed. and only then if the soil becomes dry to the touch an inch below the surface. but temperatures and humidity will drastically affect your plants health as well. House plants, even though they may be of a tropical nature would rather sacrifice a few degrees of temperature in the home than the moisture in the air which they need to survive. to accepting the lesser of two evils; cool temps or lack of humidity. Heated rooms, by nature tend to be dry rooms, especially if they are heated with forced air, or fire. Even rooms that have steam or hot water radiant heat will be somewhat dryer. while still remaining comfortable for yourself, but never below 50°. 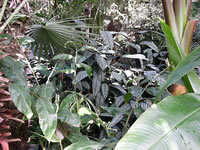 Generally, tropical plants enjoy a relative humidity of 50%-70% and warm temperatures. so it may be necessary to sacrifice a few degrees of warmth in lieu of an increase in the humidity. a humidifier or aquarium, especially during the winter months. Frequent misting will help considerably. Keep in mind that because glass is a poor insulator, the temperature near windows will be considerably colder. At night, be sure to close the drapes or move the plant to a warmer part of the room. Succulents being the most notable exception, in that they prefer warmer and drier conditions. At temperatures below 60°, African Violets will stop blooming, Poinsettias may drop their leaves, and the leaves of Gardenias may turn yellow. for more tips about keeping your house plants happy and healthy!